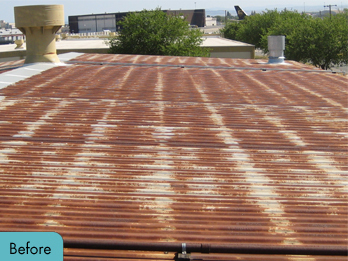 Metal roofing has been used for centuries with great success in many different environments. 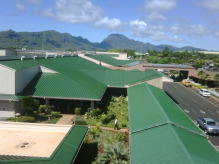 In the last 30 years, standing seam metal roofs have become very popular in the commercial building world due to their strength and ease of installation. These roofs are installed by snapping sections together, then fastening the sections down with rubber grommet screws. Sealant is placed in the seam and at each lap to keep water from migrating to the interior of the building. Unfortunately, over time the grommets and sealant can weather and fail causing rust to develop, weakening the long term performance of the roof. 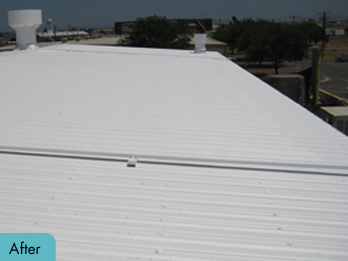 National Coatings has a long history of success restoring and enhancing the performance of metal roofs. We use high performance rust primers to inhibit future rust growth after it is removed in the preparation process. We use butyl tape products or caulk and fabric on all seams and screw penetrations to ensure a watertight building. We then apply a top coat that is engineered to the highest standards in the acrylic coating industry. 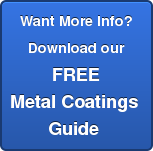 These top coats offer high reflectance, durability, and a history of proven performance. AcryShield A179, A400, A500, A510, A550, A590, RustShield A120, AcryFlex A150 and Butyl Seam Tape/Caps. For a list of all our products, click here!